Show Way is a very special book about the author's own family history is beautifully told and accompanied by stunning illustrations. 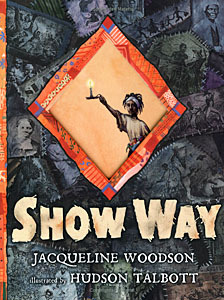 The story follows the women in Woodson's family tree, from the women who lived many generations ago through slavery and the Civil War, to the women who experienced emancipation and early freedom, right up to the woman who lived through the Civil Right movement and raised the woman who wrote this book. Together, it makes for a moving story that's both tragic and inspirational. As much of the book focuses on the first few generations' lives in slavery and contribution to the Underground Railroad, this book would make an excellent addition to American History units on slavery and the Civil War. School Library Journal and Booklist both gave this book a starred review. Booklist called the book "a must for the classroom" and promises that it "will move many readers to explore their own family roots." And S.L.J. 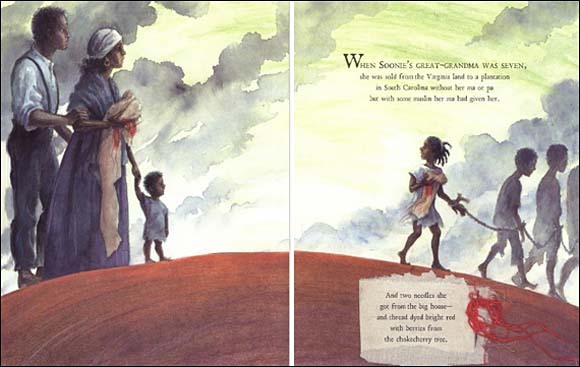 called it "an outstanding tribute, perfectly executed..."
Here's a spread from this book, showing a slave family being torn apart. The child depicted is one of the generations of women highlighted in this book--all ancestors of the author. 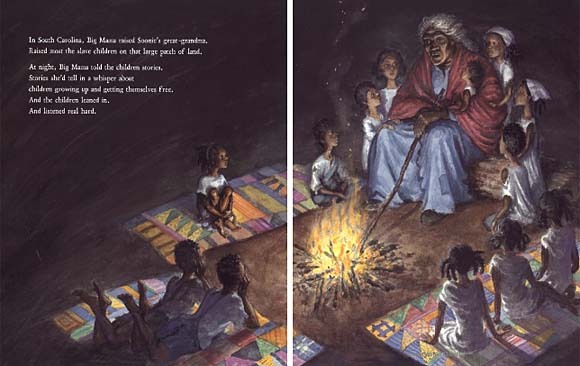 This spread depicts the author's distant relative sitting by the fire at night listing to stories about freedom told by Big Mama, who raised her and the other parent-less children.